SAN JOSE, Calif. (KGO) -- A turkey giveaway in San Jose got so big it had to be moved to the Earthquakes Avaya Stadium. More than 3,000 families lined up for a food box this year, despite the cold and the rain. City-Team San Jose usually holds the give away at its offices. Organizers say rising rents are creating a lot more need this year. "They are waiting out in the cold because that is the desperation in our community right now to have food on the table and to feed their families and their children," said Carol Patterson of City Team. 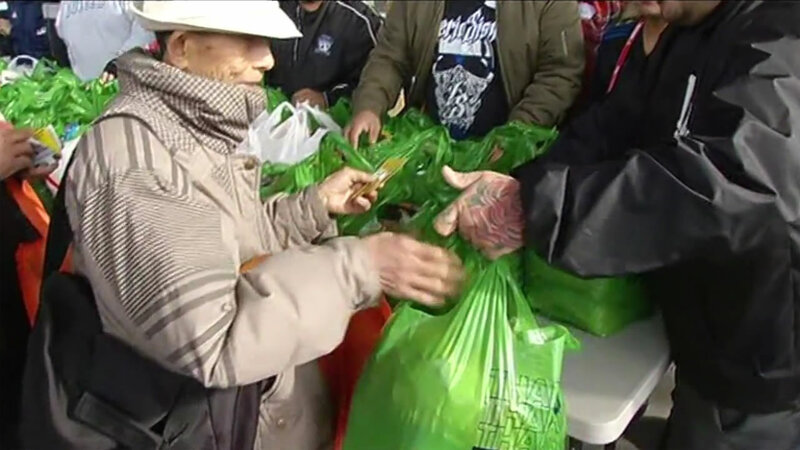 More than 500 volunteers helped hand out the food boxes, including staff from the San Jose Earthquakes. In Oakland, more than 2,000 low-income families enjoyed some holiday cheer Tuesday at the city's 24th annual Thanksgiving dinner at the Marriott City Center. Those in need got to eat full turkey dinners, listen to music and pick up winter coats. Volunteers came from across the East Bay to serve at the event. Funds for the meal were donated through the city's Hunger and Homeless program. Click here to find out how you can Give Where You Live.